I’m a big fan of particles. I’ve created quite a number of particle effects in Flash, and have posted many examples at flashandmath.com. 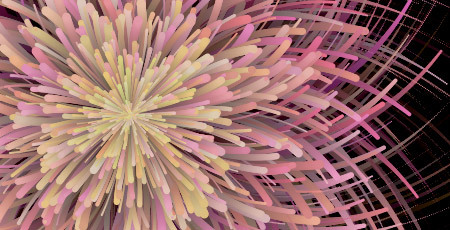 So naturally I am drawn to particles while undertaking my new experiments in HTML5 Canvas. Animating lots of particles can create a heavy load on the CPU, but to my surprise the greatest bottleneck I have encountered is not in drawing the particles, but rather in getting them to fade out gradually. Click here or on the screenshot below to see the effect, and then stick around to read my observations on browser differences and resulting issues with fading trails. A slightly nicer version of the effect (larger and with more particles) is here. It looks lovely in Chrome, but the trails do not fade in the desired way in IE9 or FireFox. The reason for the differences will be explained below. I won’t explain all the details behind the code, but rather will focus on the fading trail methods being used. The particle animation code is fairly well optimized, with particles stored in a linked list rather than an array. (For an excellent introduction to linked lists, see this tutorial by Michael Baczynski). There may be a few opportunities for optimization remaining in the code, but in my testing I found that the greatest bottleneck in performance is caused by the method I am using for fading out the picture gradually as new particles are drawn to the screen. The particles are drawn as filled in circles, and they evolve over time. The way they evolve over time is controlled by some “envelope” time parameters: attack, hold, and decay. (These terms are borrowed from the audio synthesis world, where the attack, decay, sustain, and release parameters control how a tone changes over time while a key is pressed and held.) During these different time stages, a particle’s size will change from its initial size to its “hold” size, then decay back to a final size. Each particle has an age parameter which records how long the particle has been on the screen, to keep track of the time stage for the particle. When particles either reach the end of their lifespan or go off the boundaries of the display area, they are removed from the list of active particles. However, they can be reused, so they are stored in a recycle bin (also a linked list) for future use when more particles need to be added to the screen. (The proper name for the recycle bin is an “object pool”.) This is an optimization technique which avoids the creation of new Objects. Each particle has a Boolean parameter right, which controls whether the particle tends to turn to the right or to the left as it flies in the plane. The turning is controlled by changing the acceleration of the particle with randomized amounts, and always in a direction perpendicular to the direction of motion. On every refresh of the screen, the particles are moved to new positions and then must be redrawn. If we simply want to see the new particles in their new positions, we should wipe out the screen by drawing a filled rectangle over the entire canvas before drawing the particles. But a more interesting effect is created by simply darkening the previous image and drawing the newly positioned particles over the top of the display. We then see a fading trail behind each particle as it flies through the plane. But this is easier said than done in the HTML5 Canvas. One fading method is to draw a black rectangle over the whole display, but with a very low alpha value. To see this in action, click here, but be aware that this looks great in Chrome but doesn’t achieve the desired effect in IE9 or Firefox (you can check other browsers). The problem is that as the previous images fade out, they never reach color component values at zero, resulting in permanent gray marks as seen in the image below. This effect is no doubt due to the way color component values are stored as integers ranging from 0 to 255, manipulated as floats, and then stored again as integers. Interestingly, Chrome seems to handle this arithmetic differently from the other browsers. Here is what seems to be happening. If we draw a black rectangle with alpha 0.1 over an image, then the pixels behind the rectangle should darken to 90% of their previous value. But if the previous value was 5, then 0.9*5 = 4.5, which gets rounded back up to 5. In other words, the value will not change. The effect is more drastic if we wish for a slower fade: if we draw a black rectangle with alpha 0.01 over an image, then color component values at 50 will stay at 50 (because 0.99*50 = 49.5). I can’t say for sure what is happening in Chrome, but I suspect that color component values are always rounded down to the nearest integer. So for example, when we darken a color component value of 5 by 10%, the resulting value of 4.5 is rounded down to 4. Because of the rounding down operation, colors eventually fade to black. So how can we achieve a consistent look across browsers? One idea is to copy the current image to another canvas, and then redraw it to the screen with a lower alpha value, by adjusting the globalAlpha value prior to redrawing. But this essentially causes a similar kind of pixel arithmetic as in the black rectangle method, and we again see the gray trails (click here for an example using this method). After this, we can now draw the particles over the display in their new positions. So for consistency across browsers, we ended up requiring some code which directly accessed the pixels of the display and altered them to our liking. This is clearly the type of operation that would benefit from hardware acceleration, and to be sure this will become easier to do in the near future. I would be pleased to hear from you if you have any more thoughts on how to achieve this fading effect in an efficient manner! Hey, have you found any less CPU intensive solutions for this issue? I have a million use cases for the low alpha fills, but I can’t stand the residue. Let me know if you find any other solutions! I’m afraid not. One simple (but maybe unsatisfying) solution is to use a background which is the same color gray as the trail residues. This sort of thing is where Flash excels. You can apply a color transform to the whole display and it’s very fast. Sadly, Flash is being replaced (somewhat) by a technology which is inferior in some respects. But I’m sure it won’t always be that way. Give it a year and everything will be different! Yeah, I think the only issue with that solution is that residue may vary on canvas implementations from browser to browser. Not sure yet. Plus they are changing all the time, like you said. I started getting into animation/games with canvas, and many times have considered dropping it to focus on Flash. There are definitely a lot of things that Flash has figured out. But the future is definitely looking bright for canvas. Can’t wait to see where things go! Keep up the great articles, Dan! You don’t have control per particle how quickly they fade, but if they all fade the same this could be used to solve this problem in constant time. Can you explain in more detail? It seems this is equivalent to the method I’m talking about above (unless I’m mistaken), and the gray trails will still be present.